A senior police officer known in Pakistan for campaigning against the Taliban has been killed in a bomb blast in Karachi. Chaudhry Aslam, the head of the city's anti-terror operations, and at least two others died in an attack on a police convoy in the Essa Nagri area of the city, reports say. Mr Aslam had survived a number of previous attempts on his life. The Pakistani Taliban said they carried out Thursday's attack. Chaudhry Aslam was one of Karachi's highest-profile police officials, known for leading daring police raids and gun battles against militants in some of the most dangerous neighbourhoods of Karachi. Scores of suspected criminals and militants were killed or captured on his watch. But not everyone approved of his unconventional methods. Some saw him as too powerful and too resourceful, seemingly operating above the law. He was accused of deaths in custody and staging "fake encounters" in which suspects are killed rather than arrested, charges he denied. Pakistani TV channels often showed him holding news conferences and brandishing sophisticated weapons he claimed to have recovered in police raids. Mr Aslam carried on with his tough-cop image despite a number of attempts on his life. But on Thursday, the militants caught up with him. His murder is being seen as a major blow to the government's efforts to fight crime and militancy in Pakistan's biggest city. A spokesman said Mr Aslam had been targeted as he had "killed, tortured and wounded" Taliban members. A car carrying explosives smashed into Mr Aslam's convoy. Images from the scene show a number of vehicles completely destroyed and nearby buildings damaged. Prime Minister Nawaz Sharif paid tribute to the police chief and condemned the attack. "We will not let the will of the nation be crushed by these cowardly acts by terrorists," Pakistani newspaper Dawn quoted Mr Sharif as saying. Correspondents say that Mr Aslam was a well-known figure in Karachi. Since 2008, his unit has been involved in the arrests of dozens of militants - including would-be suicide bombers - planning attacks in Pakistan and across the border in Afghanistan. 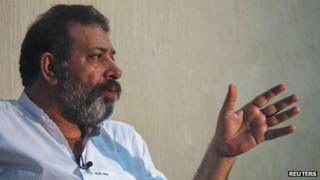 But the BBC's M Ilyas Khan in Islamabad says Mr Aslam was often accused of carrying out "fake encounters" - capturing and killing militants in staged gunfights instead of taking them through the courts. An internal police inquiry cleared him. During his final raid, in the early hours of Thursday, three militants were injured in a gunfight in the Manghopir district but were dead on arrival at hospital. Our correspondent says that such a dogged and harsh pursuit of militants made him a long-term target of the Taliban. Mr Aslam had escaped unhurt when a car packed with explosives blew up outside his home in Karachi in 2011, killing at least eight people. After that attack, he said: "They are cowards. They call themselves Muslims but they are unbelievers. This will make me even more determined to carry on operations against them. "They targeted sleeping children. I walk these streets day and night. If they want to kill me, they should come and attack me directly," he said.